We’re getting down to the nitty-gritty on the Seven Dwarfs Mine Train. This week contractors were kept very busy working on the long list of little details that needed finishing around the attraction. From new welding on the track, to a wider emergency staircase, to a whole bunch more trees, Snow White’s Mountain has really changed character in just the last few weeks. Meanwhile, testing has begun with actual people riding the roller coaster. The May 2nd grand opening will bring the newest family-style coaster and the final element of New Fantasyland. 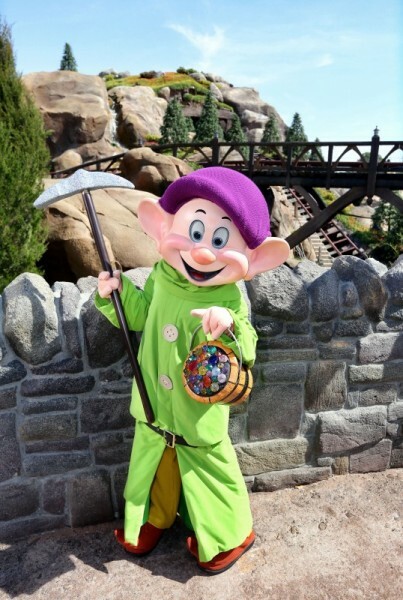 On board the attraction, guests will be treated to an exciting, musical ride into the mine “where a million diamonds shine” as the lovable world of Sleepy, Doc, Grumpy, Bashful, Sneezy, Happy and Dopey comes to life. One feature will be first-of-its-kind ride vehicles mounted in cradle-like pivots that allow the vehicles to swing back and forth during the ride. Adding to the fun, the journey will be accompanied by beloved music from the Disney film classic. On their adventure, riders pass by animated figures of Snow White, the Seven Dwarfs and playful forest critters.